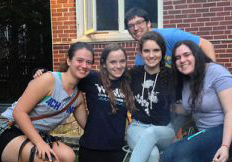 Chicago Young Judaea started off the year with a blast! Stepping up to the challenge of planning consistent year round events, nine teens met with Chicago’s YJ rep, Lee Gruen at the home of Kayla Lesch last Sunday for an afternoon of leadership training. Discussing what it means to be a leader and what they hoped to see happen in Chicago, the group laid out a schedule for the upcoming year including laser tag, social action events, and overnighters. After the leadership training, all Chicago Bogrim were invited for dinner and a campfire. The event had a great turn out, with almost twenty kids coming from all over the Chicago area and even Indiana. The evening was spent playing ice breaker games, catching up with friends, and of course, eating s’mores. With the music playing and kids sitting around the campfire roasting marshmallows, the atmosphere in the Lesch’s suburban backyard felt like it was right back at camp. “I’m so excited to see real events happening in Chicago. And it was great to work with Lee, “ -Ben Hirsch, 15. “I love seeing all my daughters camp friends together in our backyard,” -Debbie Lesch, mother of campers Kayla, Ben and Aryeh. “I can’t wait for the rest of the year!” – Sam Honan, 16.